This solution comprises of a home kit, which takes care of wet waste inside your house itself using an anaerobic composting technology. Maintenance: The composting process and maintenance is simple. One bins needs to be filled at a time: while one full bins ‘pickles’ the other is used to fill daily household organic garbage. Can be used as a regular kitchen dustbin. Each bin takes about 3 to 4 weeks to fill, for an average family size of 4-5 people. The pickled waste needs to be layered with compost and allowed to rest for 3 weeks to form compost ready for use. Dimensions and Installation: Each bin is about 2ft tall. The bins are designed for indoor use and can be placed in any shaded area. Services: These bins do not require any servicing. However, if required, we can provide a service for the layering process. 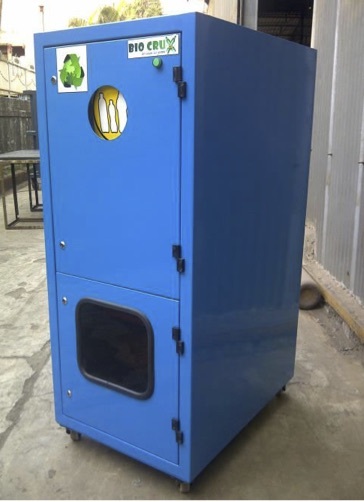 This is a manual composting solution comprising of two rotating drums on a stand. One drum needs to be filled at a time with wet waste. Each drum has the capacity of taking in 10kg of waste per day and takes about three weeks to fill. Once full the garbage takes a minimum of three weeks to compost. The compost then needs to be spread out to dry for two days and then can be used as a rich fertilizer. Maintenance: The drums need to be rotated well, about five tImes, at least twice a day. The moisture needs to be controlled within the drums to keep it at an optimal level for composting. Dry leaves from the garden or sawdust can be used for maintaining optimal moisture levels. Excess moisture drains into the trays below the drums and can be used diluted 1:10 as liquid fertilizer in the gardens. 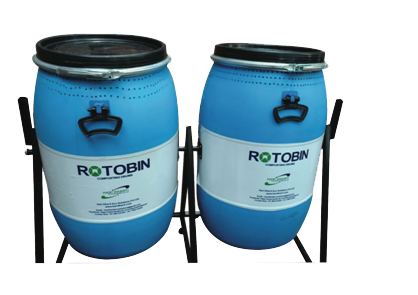 Dimensions and Installation Requirements: Dimensions of the Rotobin set are: 4ft x 3ft x 4ft. This will require ground space of atleast 5 ft x 5ft with a canopy to prevent rain entering the drums. We can also provide a Rotobin set with a Canopy, which would increase the height of the Rotobin from 4ft to 9ft. Services: For the first month, we provide a weekly service + training to your designated staff for use of the Rotobin, maintenance of optimal moisture levels, and rotation of drums. Alternately, we can provide a servicing agreement, where our person will visit the premises twice a day, rotate the bins, monitor optimum moisture levels, keep the place clean, and dry out the compost once ready. 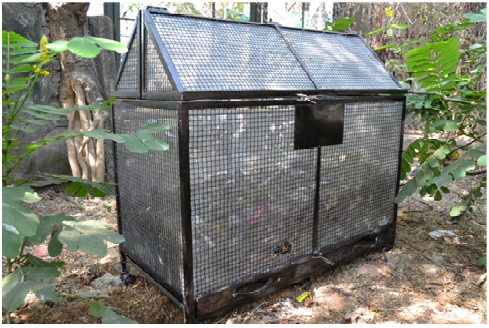 This is a manual composting solution comprising of a minimum of two wire mesh baskets. A starter culture is added for the first time use of the basket. One basket needs to be filled at a time. The standard sized basket can take upto 25 kg of wet waste on a daily basis and would take upto three weeks to fill completely. Maintenance: The garbage needs to be thoroughly mixed and turned over on a daily basis. Once the basket is full, the second basket is to be used for collecting the wet waste, while the waste in the first basket will take a minimum of three weeks to compost. Requires daily raking and optimal moisture control. Once ready, the compost needs to be laid out in the sun to dry for a couple of days. 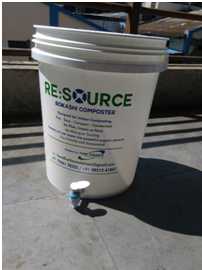 A starter culture equivalent to the estimated daily load of wet waste being put into the Biobasket will also need to be purchased (we will provide). This culture expedites composting of the wet waste and minimizes odour from the decomposting wet waste. Dimensions and Installation Requirements: Each BioBasket measures 4ft x 2ft x 4 ft, and would require ground space of atleast 8ft x 4 ft with a covering canopy to protect it from the rain. Services: For the first month, we provide a weekly service + training to your designated staff for use of the BioBasket, proper raking of the waste in the Biobasket and maintenance of optimum moisture levels. Alternately, we can provide a maintenance contract for the BioBaskets, where our person will visit once a day to rake through all the BioBaskets to ensure proper mixing, monitor the moisture levels and dry out the compost once ready. This is a mechanized solution.The waste is converted to compost within 24 hours. The compost needs to be harvested only when the machine is full. Runs on electricity. Maintenance: This is a low maintenance machine. Runs 24 hours and all that needs to be done is to put in the waste at one end of the machine and remove the compost at another end whenever the machine is full. Dimensions and Installation Requirements: The machines come in various sizes, starting with a capacity of 50 kgs. per day going upto 500 kgs. per day. Dimensions of the machine vary from 5’ x 3.8’ x 3.5’ for a 50 kg daily capacity machine to 9’ x 8.5’ x 5’ for a 500 kg daily capacity. The machine will need to be installed in a covered area to protect it from the sun & rain and a space for an exhaust outlet for water vapour will be needed. Services: For the first year, there will be visits every quarter to check on the functioning of the machine. Proper training will also be provided to the staff for usage of the machine. There will be no charge for these services for the first year. There is no AMC required thereafter, and engineers will be available on call, at a nominal cost should there be any requirement. AMCs can also be made available upon request. Ensure	Your	Plastic	Bottles	are	Recycled	with Biocrux – G,	is	an	automatic,	sound	proof,	PET/	Plastic	granulator	machine. Once	the	bottle	is	inserted	into	the	mouth	of	the	machine,	it	starts	automatically	and	crushes	the	bottle	into	fine	pieces	within	40	seconds. The	machine	then	shuts	automatically	and	remains	shut	until	the	next	bottle	is	fed	in. The	granulated	plastic	will	be	collected	periodically	and	recycled	into	other	products.